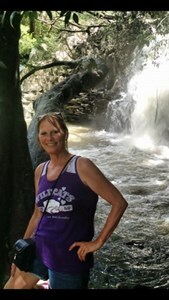 Brenda Sue Manning, 55, of Chapman, died Saturday, March 30, 2019 at her home in Chapman. Brenda was born Oct. 9, 1963 in Kokomo, Indiana, the daughter of James and Frances Darlene (Decker) Moritz. She attended and graduated from Riley County High School in the Class of 1981. She was a civilian employee at Ft. Riley working as a clerk for contractors. Brenda was a member of St. Francis Xavier Catholic Church. Brenda married David Manning on Sept. 12, 1983 in Junction City. He survives. Other survivors include: 2 sons, Chris Manning (Andrea), Salina, and J.R. Manning (Randi), Chapman; a daughter, Amanda Manning, Chapman; her mother, Darlene Moritz, Chapman; a brother, Harvey Moritz (Stacy), Chapman; 3 sisters, Marilyn Ferris (Monty), Wamego, Loretta Fisher (Joe), Chapman, and Sandra Barbee (Curtis), Chapman; and 8 grandchildren. Brenda was preceded in death by her father, James Moritz. Funeral services will be 10:00 a.m., Thursday, April 4, 2019 at Johnson Funeral Home in Junction City. Burial will follow in St. Mary's Cemetery in Junction City. The family will greet friends Wednesday evening, 6:00-8:00 p.m. at the funeral home. A Prayer Service and Rosary Service will be at 7:00 p.m. on Wednesday at the funeral home. Memorial contributions may be given, in Brenda's name, to Home Health & Hospice of Dickinson County, 1111 Brady, Abilene, Kansas 67410. Add your memories to the guest book of Brenda Manning. Dave and family, my condolences and sympathy on the loss of Brenda . We met briefly years ago through Dave. Dale thinks very highly of him/Dave. We will think of him and all of you on the family Loss of mother and wonderful Spouse and family member. My sincerest condolences on the passing of Brenda. She was a wonderful classmate and friend. I will always remember her big smile and dimples in her checks. She will be missed but forever remembered in my heart. Dave (Sandy, Loretta, JR) - Our deepest sympathy to you and the family. I can't imagine the emptiness you all are feeling. I always enjoyed seeing Brenda - usually at the post office. We are definitely thinking of all of you. My most sincere condolences to each of you. May the many memories bring you comfort. My cousin... your laughter, smile, tell it like it is, straight forward approach to life will be missed by all of us! You once told me that every family has a black sheep and we're it! I do believe we earned the title and I was damned proud to share it with you! If I could choose my own Guardian Angel, I would, without a doubt, choose you! Fly high in the Heavens until the rest of us join the infamous Decker Family Reunion!